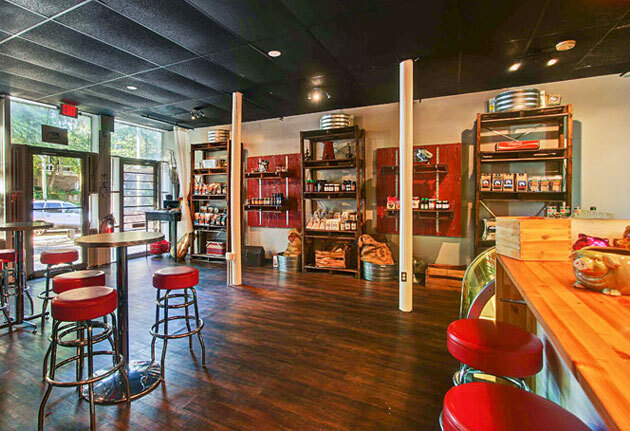 Tonight: Cardamom Hill closes for good. Tomorrow through Thursday: you walk around with slumped shoulders and a sad stomach. Friday: Spice to Table, Asha Gomez’s casual and exotic new Indian patisserie, opens for breakfast and lunch at Studioplex. Suddenly, all is right in the world again. The pedigree: You know Asha. Started by operating a secret supper club out of her home. Eventually opened Cardamom Hill. Churned out an event space along the way. That old career path. The space: Glass garage doors. Wooden communal tables. Antique shelves from India. Smells like samosas and seven-spiced carrot cake. Sounds like a Bollywood soundtrack. The drinks: Breakfast-y stuff like teas, hot chai and a house blend of coffee. Things that will all work to your advantage at 7:30am on a weekday. The food: Whatever’s on that day’s menu. Think pork vindaloo sandwiches, curried-chicken-stuffed bread and goat tongue sandwiches. Not enough tongue in this town. Assuming you go there, otherwise it’s mostly just those other people.